An oft-quoted word of wisdom from Warren Buffett is that as an investor, one should be “fearful when others are greedy, and greedy when others are fearful”. This quote makes more sense if you look at the data of mutual fund holdings for the last four quarters. Fund managers raised stake in as many as 168 stocks consistently in the last four quarters. However, more than 70 percent of the stocks gave negative returns in the same period. 130 out of the 168 stocks have accrued negative returns. 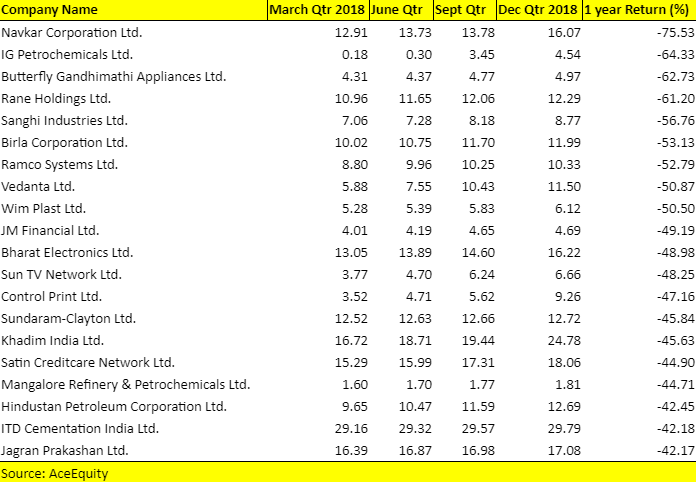 The list includes Navkar Corporation, IG Petrochemicals, Butterfly Gandhimathi, Rane Holdings, Birla Corporation, JM Financial, Sun TV and Birla Corp.
Only 38 stocks have accrued positive returns in the period. Table: List of worst 20 stocks out of 130 in descending order of negative returns in the last 1 year. Most of the stocks belong to the small and mid-cap space that have continued to bleed in 2019, after a disastrous 2018. Both S&P BSE Midcap and the Smallcap indeces have plunged about 7 percent each so far in 2019. The 38 stocks that gave positive returns include Vinati Organics, RIL, Sanofi India, L&T, Tech Mahindra, Titan Company, Asian Paints, Axis Bank, City Union Bank, Varun Beverages, ITC, ICICI Bank and SBI. Overall, the assets under management (AUM) grew in January 2019. The mutual fund industry witnessed a net inflow of Rs 65,439 crore in January as against an inflow of Rs 1.06 lakh crore in the same month last year. Amid market volatility and political uncertainty, inflows into equity mutual funds plunged 60 percent to Rs 6,158 crore in January against Rs 15,390 crore seen in such schemes in January 2018. This also marked third consecutive monthly decline in inflows into equity funds, according to the data available with Association of Mutual Funds in India (AMFI). The drop in inflows has pulled down the asset base of equity mutual funds to Rs 7.73 lakh crore at the end of January this year from Rs 7.87 lakh crore a year earlier. “Fall in equity flows in January marked the lowest inflow in almost two years in equity schemes. Meanwhile, net outflows in the balanced category came in at Rs 952 crore as against net inflows of Rs 45 crore in December 2018. This is the first net outflow since May 2014 for the category,” ICRA said in a report. Can they be termed value picks? Following someone's methodology could not be the sole decision maker for investments because the exposure to certain stocks could be different along with holding horizon, and thus, it is imperative to stick with a fundamental outlook of the company. This makes sense to keep it as a first-level of screening mechanism, and top-up with self-research on the basis of ratios like ROCE, EBITDA Margin, leverage ratio and cash flow position among others, suggest experts. Can we call these stocks a value proposition? Well, we can, but not every stock. In the past, multiple for most of the mid and small-cap stocks rose at an exponential pace. And, the premium quotient is still high, but there are certain stocks which could be added to one's portfolio, suggest experts. "The overall sell-off in this section also took toll on quality names in mid and small-cap names which were trading at higher valuation earlier. 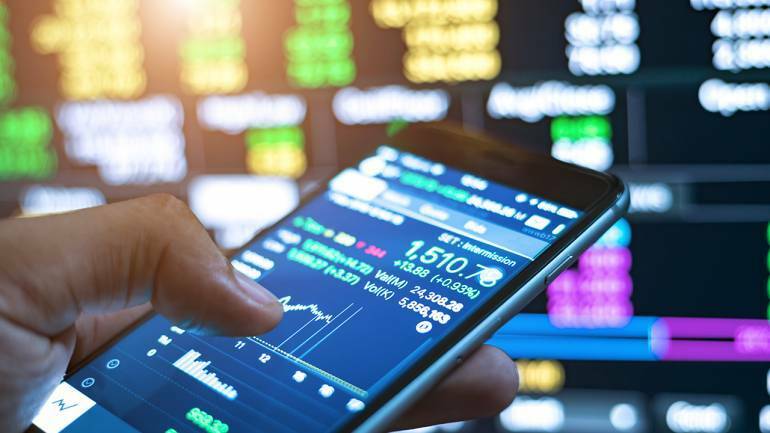 Although the valuation still remains relatively at higher end by and large in the broader segment, few names in this space saw a significant decline in valuation in recent correction," Dinesh Rohira, CEO and Founder, 5nance.com told Moneycontrol. "Thus, it is prudent to assume that it offered ‘value’ proposition for selected names which saw additions in the overall stake. However, with earnings being just at par to muted for most of the companies in the last few quarters, it (market) continued to remain under pressure for an extended period. Further, governance issues across a sector weighed on sentiment across market which further took a negative turn in most companies," he said.